Chalk Talk: A Kindergarten Blog: What is Mass? Today we explored matter and mass. 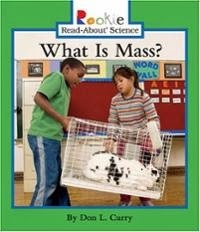 We used the book What is Mass? to generate a discussion about what mass means. We learned that the mass means how heavy something is. We also learned that anything you can see, feel, touch, and smell is matter. Objects that contain more matter have more mass. I brought out a large beach ball and a small apple. I asked my students which object they thought had more mass. Of course they ALL said the beach ball and when I asked them why they thought the beach ball had more mass they said because it was bigger than the apple. Obviously, this is a common misconception for little ones. By the end of the lesson most of my students had a clear understanding that the size of an object did not necessarily relate to its mass. We passed the beach ball and the apple around the circle so that we could compare which one felt heavier in our hands. After each child had the opportunity to hold both objects I asked them if they still thought the beach ball had more mass. A lot of them changed their mind at this point and decided the apple had more mass. Throughout the entire lesson I asked the same questions about more mass/less mass and more matter/less matter over and over. Understanding matter and mass can be difficult for some little ones, especially when mass does not necessarily relate to size. We did this simple mass comparison activity as a whole group for more practice on more mass and more matter. I placed two pictures of objects on the chart and then I called students up to tell me which one had more mass and why. Then they circled the object with more mass. Today we worked together to learn how to use the primary balance. I showed students a can of play doh and a cup of sticks. I asked them which one they thought had more mass and why. Then we used bear counters to compare the mass of the two objects. I modeled how to use the primary balance because tomorrow we will spend some time exploring balance and mass in small groups. My name is Chelsi Hardester, and I am in the College of education at Austin Peay State University. I am taking an Instructional Technology class and we were to seek out two outside blogs and comment on them in order to show how commenting can bring community. I came across your blog on pinterest and read about how you taught your students mass. I really found it very clear the way you taught them to compare two objects, which in turn made it easier on the students to understand the concept.